New Year's decoration on the door. Neu Jahrs Deko an der Tuer. 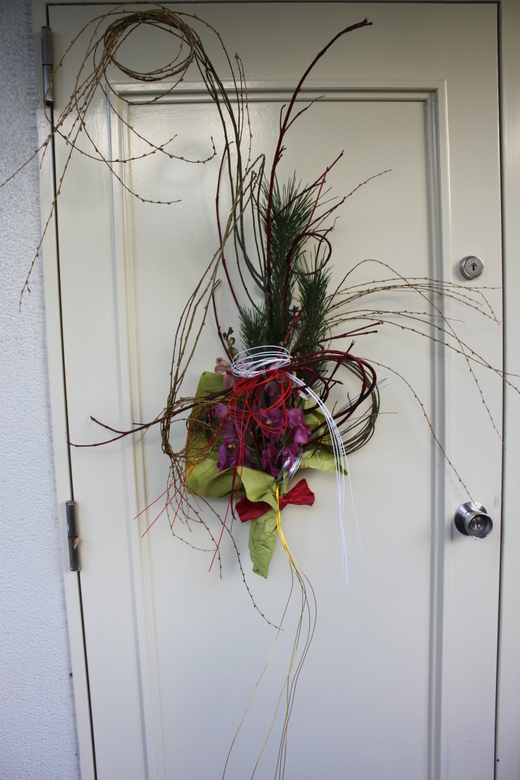 In generall "New Years decoration" "Shimenawa"
you can see hanging on the front door. But I suggest to makeyou feel free, loosen yourself from the fixed idea. or let them dangle in the air, without vases and kenzan. our ideas during the process of arranging. Im Allgemeinen haengen die Leute die Neujahrsdekoration "SHIMENAWA"
zu haengen, ohne Vasen oder Kenzan. waehren des Prozess zu kontrollieren.